Mobile hotspots like Novatel’s popular MiFi 2200 have been greeted warmly by tech users and have sold well. They simplify things by providing our various devices with Internet connectivity under one data service bill. And it's a moveable feast--mobile hotspots are superportable. But hotspots until now have connected to 3G networks, and so have provided other devices with relatively slow connections to the Web. That has now changed. 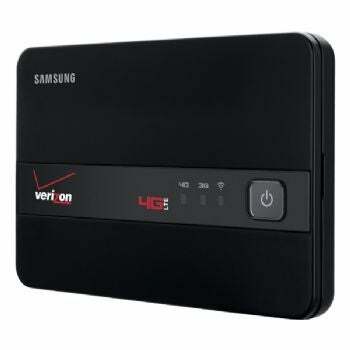 A pair of new mobile hotspots that run on Verizon’s fast new 4G LTE network--Samsung’s 4G LTE Mobile Hotspot and Novatel’s MiFi 4510L--have become available, and they easily live up to Verizon's claim that they are ten times faster than their 3G predecessors. The two devices and their accompanying Verizon data plans are priced the same at $100 with a two-year contract. For data service, you can buy a 5GB plan for $50 per month or a 10GB plan for $80 per month. Both plans charge $10 for every gigabyte of data you use over your monthly limit. So which device is the better buy? I break them down feature by feature to find out. In a nutshell, I found a number of small differences--and one big one--between the two devices, and ultimately chose in the Samsung's favor. Let’s get right to that “big difference”. By far the biggest complaint about these 4G hotspots (4G phones, too) is battery life. It seems that when connected to fast 4G service, hotspots simply need more juice than when in 3G mode. To test the longevity of the batteries in these two devices, we streamed a movie continuously to a hotspot-connected device until the battery in the hotspot failed. The Mifi 4510L by Novatel came up well short on battery life in our tests. Here the Samsung outperformed the MiFi. Samsung says its hotspot battery will last for “up to 226 minutes” or 3 hours and 46 minutes. The Samsung battery lasted for 3 hours and 26 minutes in our test. Meanwhile, Novatel says the battery in its LTE hotspot will last “up to 5 hours." In our tests the MiFi came nowhere near that estimate, running out of gas after just 3 hours and 6 minutes. But regardless of the manufacturers’ projections, the battery life of these devices is clearly lacking. The companies that make the 4G radios inside these devices must begin to use components that require far less power, or the battery makers need to learn how to make batteries that last longer. A hotspot capable of a full day of work would seem to be a reasonable expectation, and until that expectation is met, consumer adoption of hotspots will have a real ceiling. Despite battery conservation being so important to using these devices, neither Samsung nor Novatel offers a very accurate way to monitor your battery use. The tiny LED light on the Samsung hotspot stays green until the battery gets down to 20 percent, then turns yellow. But the two colors look so much alike, and the LED lights are so small, that I never noticed when they changed color. The battery indicator on the MiFi uses the same four-bar icon as some phones. So it at least changes every time another 25 percent of battery life has been used, making it easier to know how much of that big 3 hours and 6 minutes of battery life you have already consumed. The MiFi thankfully gives you about 2.5 minutes of grace time after the last bar disappears before shutting down. Well aware of the limited battery times, both Novatel and Samsung built into their devices an auto-shutoff feature that powers down the device after 30 minutes of idle time. Many people actually complained about this in the product reviews at the Verizon site, apparently unaware that you can shut it off in the configuration settings. Both LTE devices take up just a few millimeters more table space than a credit card. The MiFi is more than half an inch thick, while the Samsung is a little less than half an inch. The MiFi weighs 3 ounces, and the Samsung weighs 2.7 ounces. Samsung's LTE Mobile Hotspot delivered slightly better speeds and better battery life in our tests. Both hotspots are pretty much plug-and-play. No software installation is required (the drivers are installed in connected devices automatically), and neither is any configuration (although, of course, you can adjust the settings). The set-up process for the Samsung and the MiFi is almost identical. After you power up the devices, they automatically connect to the Internet via an LTE cellular connection (provided you have an active SIM card inserted correctly underneath the battery). 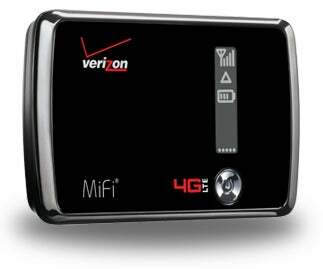 Once connected to the Verizon network, the hotspots then send out a Wi-Fi signal to connect your devices to the Web. When that signal is detected by your laptop or smartphone, you’ll see the name of the hotspot listed in the “available networks” list. After you select the hotspot from the list, you’ll be asked to type in the network password, which is supplied in the literature and printed on a sticker underneath the back panel. And that’s it--you’re connected. You can repeat this process with up to four other devices, but remember that the devices are sharing the same pool of bandwidth that the hotspot is pulling down from the network. Thankfully, with LTE service that pool is pretty big. To monitor your data usage you can log in at www.verizon.com/myverizon. On the front of the Samsung you’ll find three small status lights, one for 4G network connection status, one for 3G network connection status, and one for the status of the Wi-Fi signal that the hotspot is sending out to connect other devices. The 4G light is green if the signal is strong, yellow if the signal is weak, and red if there’s no signal. If the light is rotating through the colors, that means you’re roaming. The 3G light uses the same colors for the same meanings. The Wi-Fi light is blue for connected, blinking blue when transmitting data, green for standby, and blinking green if the device is in setup mode. The power button on the front is also filled with meaning. It’s solid green if the battery is more than 20 percent, solid yellow if the battery is 6 to 20 percent, and solid red if the battery is down to 1 to 5 percent of capacity. You press and hold the power button for 2 seconds to turn the hotspot on, and for three seconds to turn it off. Novatel’s MiFi has somewhat simpler status indicators. The top screen has a four-bar signal strength indicator, a triangle-shaped roaming indicator, a four-bar battery indicator, and a five-dot indicator to show how many devices are connected. The LED light on the front side of the device offers more device status information. Amber means the hotspot is in standby mode and may be charging. Green means 4G service is on, and violet means 3G service is on; in both cases, if the light is blinking it means data is being transmitted. A red light means a SIM card error has occurred. As I mentioned up top, these two devices are different and better than any other mobile hotspot on the market because of their connection speeds. Verizon says users should expect download speeds of 5 to 12 megabits per second (the average home broadband connection speed is 6 mbps), and upload speeds of 2 to 5 mbps. To test this, I connected my PC to each hotspot, and then ran the speed and latency test at speedtest.net, operated by Ookla. I found that both devices regularly met or exceeded Verizon’s speed projections, even in a difficult cellular environment (well inside a structure with several physical barriers between the radio and the outside). From my desk at home, several of the 3G hotspots I’ve tried couldn’t establish a connection because it’s a very difficult cellular environment. I have to use an amplifier even to get wireless voice service. Of the two 4G hotspots in my home tests, the Samsung connected at slightly higher speeds than the MiFi, although the difference is so small that it might not be significant. The Samsung clocked an average download speed of 12.1 mbps and an average upload speed of 4.1 mbps. However, I saw download speeds of up to 20 mbps during my tests, and upload speeds as high as 15 mpbs. The average latency or (network delay time) was impressively brief, at only 54 milliseconds on average. The MiFi clocked an average download speed of 9.4 mbps and an average upload speed of 4.5 mbps. But with the MiFi, too, I saw some very high peak speeds, meaning downloads of up to 17 mbps and uploads as high as 7 mbps. Latency speeds were even better on the MiFi, averaging a mere 50 milliseconds. I also tested connecting to the hotspots from long range, by moving my PC to a position 30 feet away in an adjacent room. I first selected the Samsung hotspot from the list of available networks on my PC. The Samsung paused for perhaps 30 seconds before it could begin transferring data. Once a connection was established, the Samsung connected the PC at just 0.80 mbps for downloads and 1.1 mbps for uploads, on average. The MiFi performed somewhat better than the Samsung at long range. In my test, the MiFi began transferring data almost immediately, and connected at higher speeds: an average download speed of 2.5 mbps and an average upload speed of 1.5 mbps. This may suggest that the Wi-Fi signal emitted by the MiFi is a bit stronger than that emitted by the Samsung. But since most people won't need to stray so far away from their hotspot, and because the Samsung did get the best speeds overall, Samsung wins the speed category. Both devices are backwards compatible with Verizon’s 3G service (CDMA 1xEV–DO Rev.A), meaning they downshift to a slower (in this case, much slower) 3G connection when the 4G LTE signal is not available. I noticed no interruption in connection when either device moved back and forth between 3G and 4G, although the devices were connected to 4G service most of the time during testing. The good news about both of Verizon’s new LTE hotspots is that they are fast—truly 10 times faster than 3G hotspots--and deliver a much bigger pool of bandwidth to the devices that will connect to them. That’s huge. In our speed tests, we found that both devices delivered impressive speeds, with the Samsung hotspot testing marginally faster overall. The apparent cost of the fast 4G service is battery life. The LTE technology inside both the Samsung and the MiFi drained battery life in a hurry. But our tests show that the Novatel MiFi simply doesn’t operate as long as the Samsung on one charge of the battery. So while the Samsung definitely has its defects, its slight superiority in throughput speeds and its clear superiority in battery usage earn it the nod as the better of the two Verizon LTE hotspots available now.